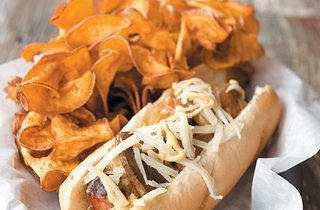 At Chicago's "haute"-dog shops, the sausage is sourced-not made. When Chicago’s Dog House (816 W Fullerton Ave, 773-248-3647) opened last month, hawking smoked alligator and duck sausages, the Lincoln Park shop immediately invited comparisons to Hot Doug’s (3324 N California Ave, 773-279-9550) whose celeb-tagged franks continue to attract around-the-block lines. 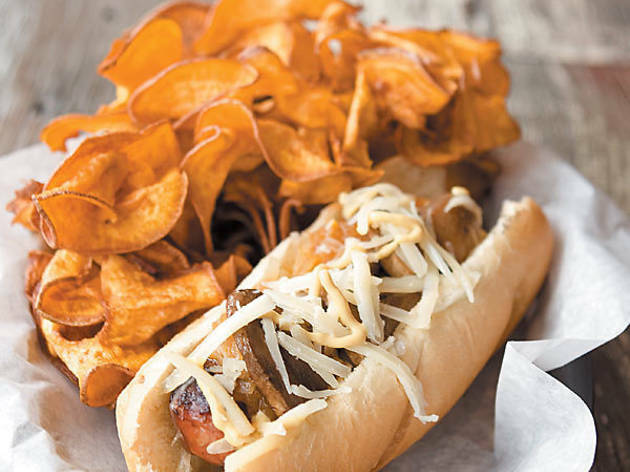 As it turns out, the two restaurants—as well as the suburban hot-dog stand Redhots (1707 Chestnut Ave, Glenview, 847-657-9200), which opened five years ago with Doug’s-inspired wild-game sausages—have more in common than you think. You may know that each of these gourmet hot-dog stands has a duck sausage: Hot Doug’s Doug Sohn infamously flaunted his foie-gras-and-sauternes one, laden with truffle aioli, foie-gras mousse and gray salt. FRedhots’s duck sausage is a mix of duck, beef, pork and orange liqueur paired with a Champagne-red-pepper-orange chutney and Peppadew mustard. And the newcomer, Chicago’s Dog House, tops its smoked-duck sausage with Swiss cheese, mushrooms, caramalized onions and Dijon. But here’s what you might not have known: None of these guys makes their sausages in-house. It’s time-consuming, space-consuming, and due to some draconian health-safety laws, only borderline legal. Instead, they source the wild-game sausages (like smoked alligator at Chicago’s Dog House, rabbit for fRedhots, or blueberry-venison at Hot Doug’s) from a variety of distributors. Those three twists on duck sausage, for instance, come from the same source: Chicago Game and Gourmet (350 N Ogden Ave, 312-455-1800), a wholesale distributor. Chicago Game doesn’t make the sausages, either: The company buys from Chateau Royal, a New York–based sausage maker whose line includes lamb merguez and pheasant-cognac. But Chicago Game does sell to everyday consumers—provided you buy in the same volume as the hot-dog shops do. (The minimum order is a nine-pound case, which means 144 sausages. One hundred and forty-four foie-gras-and-sauternes sausages go for $64.85.) Not ready to buy in bulk? Paulina Market’s (3501 N Lincoln Ave, 773-248-6272) duck, goat, lamb, wild boar, elk and buffalo sausages (available in four-piece packs) make it easy to DIY like the pros.